Of the 20 blocks in the 700, 900 and 2300 MHz frequency bands, TDC won 14, the maximum available to the telco at this auction. 3 Denmark acquired two 10 MHz blocks in each of the 700 and 900 MHz bands, while TT Network, Telia and Telenor’s joint venture, two 5 MHz in the 700 MHz and two 10 MHz in the 900 MHz band. “Several frequency blocks provide higher speed, longer range and stronger indoor coverage, which gives us a unique position to strengthen and develop the best coverage in Denmark,” said TDC CEO Allison Kirkby. With ambitious plans to rollout 5G across Denmark by the end of 2020, this is certainly an aggressive sign of intent from TDC. The telco paid NOK 1.6 billion, roughly €210 million, for its haul, while 3 Denmark paid a total over roughly €68 million. TT Network paid €14 million for its 700 MHz assets and nothing for 900 MHz, though it will be charged with coverage obligations. As it currently stands, according to Ovum’s WCIS database, TDC is currently the market leader with 42% market share, TT Network controls roughly 40% of subscriptions, while 3 collects the remaining 18%. While these prices might seem ludicrously cheap in comparison to other spectrum auctions which have been taking place around the bloc, Denmark’s population of 5.8 million ranks it at 111th worldwide, while its land mass ranks at 130th. Telia and Ericsson jointly switched on the first 5G network at KTH the Royal Institute of Technology in Stockholm, with plans for a commercial launch across Sweden in 2020. The partnership between the pair will see 5G applications tested at the university campus, creating a new innovation centre for the country. Interestingly enough, the pair claim network at KTH is permanent and constitutes the first building block in Sweden’s future 5G network. “Two years ago, we promised to bring 5G to Helsinki, Tallinn and Stockholm during 2018,” said Johan Dennelind, CEO of Telia. “So, I’m especially proud to launch the first 5G network in Sweden at KTH today. For Sweden, this partnership demonstrates why the Nordics are often the envy of Europe when looking at connectivity and the digital economy. With two of the world’s connectivity heavyweights calling Sweden and Finland home, it should come as no surprise the local telcos play a key role in the development of future technologies. According to Opensignal’s latest State of LTE report, Norway consistently features as one of the top performing countries worldwide, while Sweden and Finland are not too far behind. With 5G on the horizon it would be a fair bet to suggest these countries will be one of the best performers, though perhaps not realising the dream as quickly as countries such as South Korea and the US. 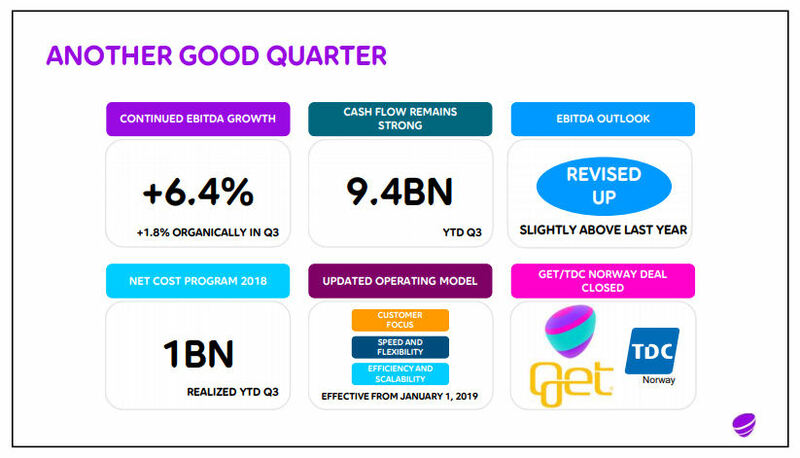 Swedish operator group Telia has a spring in its step and decided to upwardly revise its outlook following better than expected Q3 earnings. Adjusted EBITDA rose 1.8%, in the third quarter, with margin up slightly too. In his accompanying comments Telia CEO Johan Dennelind said the company’s cost reduction programme is going well and that he’s confident whatever financial objectives they set for the year will be achieved. “We are clearly on track to deliver the net cost reduction of SEK 1.1 billion that we have set out as a priority for the year,” said Dennelind. “Our operational free cash flow continues to be strong, having generated SEK 10.2 billion over the last 12 months. Our adjusted EBITDA is growing in six out of seven countries, with Finland, Norway as well as our central units being the main drivers. The performance is a combination of strong execution of the cost ambition as well as delivering synergies and stronger propositions to customers from the acquisitions we have done in recent years. Telia seems to be on a similar journey to its compatriot Ericsson, which also expressed cautious optimism when it announced its Q3 numbers yesterday. It’s early days but if vendors and operators continue to sound so chirpy we might be inclined to start drawing hasty conclusions about a 5G-fueled uptick in the telecoms cycle. The slightly lower frequency stuff apparently has a bit more value than the rest and it’s worth noting that Elisa is the market leader by subscriber number so it looks like Telia has decided to make a strategic move to close the gap in the 5G era. While Finland is admittedly a much smaller country, €77 million seems like a small return for the government when you compare it to the frenzied bidding we’re seeing in Italy. Finland is set to be one of the first nations in Europe to experience the wonders of 5G as Telia targets the beginning of 2019 for commercial launch. With tests in the Telia 5G Arena in Helsinki completed, the first base stations in the city operational and the first phase of roll-out set to be completed in the Autumn, Telia has confidently proclaimed full-scale commercial operation will be possible in 2019, just as soon as the 3.5 GHz 5G frequency auction has been conducted. It is certainly a bold promise to make, though seeing as this launch will be prior to the availability of 5G devices, who is going to know whether those crafty Finns are telling the truth or not. The on switch could well be hooked up to a couple of dozen pink and green light-bulbs spelling out ‘viides sukupolvi’ and nothing else; who would be able to tell? Perhaps the reason we can joke about the Finns having a network and no flashy devices is because it’s probably a better way to have it than the other way around. Some might mock the idea of boasting of 5G with no consumer devices to make use of it, but upon the launch of said devices, consumers in other nations will own very expensive, glitzy smartphones, connected to an imaginary 5G network. Progress has been steady in the Telia business. It is now boasting of getting to a point where all 5G network components are available, from 3GPP specification-based radio access to high capacity IP networks, virtualized core and the massive computing capacity offered by its Helsinki data centre. “We are pleased to begin the deployment of the first 5G base stations in Finland – the Nokia AirScale radio access – and we will continue working with Telia Company to identify the technologies and services that meet the demands of consumers and industries in the 5G era,” said Jan Lindgren, Head of Telia Customer Team at Nokia, a key partner of the project. While the 5G posturing has largely been left to telcos in the US, China or Korea, Telia has slipped through the peloton relatively undetected, and could in fact be one of the first worldwide to hit the on-switch. Considering the rather humble progress made by the Telia team, who would have thought we would have been saying that. Telia has announced the acquisition of GET and TDC Norway for roughly €2.2 billion as the telco looks to strengthen its hand in the convergence business. The Norwegian business of Danish operator TDC encompasses GET, a provider of fixed and TV services, as well as the B2B business in Norway. The team claims there are more than 518,000 households and businesses connected to the fiber-based network, as part of a total of one million private and business customers who use the TV and broadband services. “It is with great excitement and commitment that we announce the agreement to acquire GET and TDC Norway,” said Johan Dennelind, President and CEO of Telia. Telia has been making progress in the Norwegian market with 2.3 million mobile subscriptions, a market share of roughly 42%, with the company’s 4G network covers 98% of the country. Telenor is leading the country’s mobile stakes, though investment in fibre and video assets will certainly give Telia impetus to make moves in the market. Nokia thinks it’s important that everyone knows its cloud-native packet core solution has been chosen by Swedish operator group Telia Company. There is, of course, intense competition between Finnish Nokia and Swedish Ericsson, so securing the business of Telia must surely carry some extra weight for both of them. TeliaSonera is the clear leader in the Swedish market and Telia Finland is a solid second there, behind Elisa. It’s also a significant player in the Danish and Norwegian markets so it’s fair to say Telia is the daddy of the Nordic telecoms market. So the news that Nokia has been selected as the sole vendor for packet core for the entire group, including Estonia and Lithuania, is a pretty big deal for Nokia and conversely a blow for Ericsson. Whether anyone else should care is another matter but this is a B2B telecoms trade title and we have to cover this stuff so just back off, OK? Having said that Nokia used this opportunity to shoehorn a bunch of related product propaganda that we don’t feel like repeating, so what can you do? “There is tremendous potential with the continued growth of mobile broadband, and with new services and 5G in the near future,” explained Sri Reddy, SVP of Nokia’s IP and optical business. “To take advantage of these opportunities, Telia must deploy a new generation cloud-native packet core that is able to connect to a greater variety of devices and deliver a broader range of services over multiple access technologies. See? They always squeeze the propaganda in somehow. Just when I thought I was out, they pull me back in! And, of course, Nokia wasn’t about to let us off the hook without name-dropping 5G a couple of times. Touché Nokia – well played.